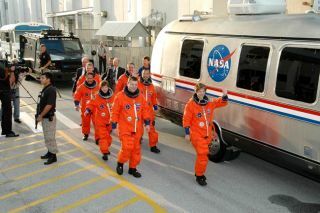 The STS-114 astronauts, clad in orange flight suits, walk out to the van that carried them to Launch Pad 39B for a simulated countdown aboard the the Discovery space shuttle. CAPE CANAVERAL, FL - The seven astronauts slated toliftoff aboard NASA's first space shuttle to fly in more than two yearsaborted the mock launch of their Discovery orbiter Wednesday, evacuating the vehicleduring a dress rehearsal of the final hours before liftoff. With just fourseconds left in their simulated countdown, the astronauts and launchcontrollers for NASA's STS-114 mission halted the launch after computersdetected a main engine cutoff in the orbiter's engines. The astronauts thenexited the shuttle and rehearsed procedures to ride slide wire baskets awayfrom their launch site at Pad 39B here at NASA's Kennedy Space Center (KSC). "We had avery good test today," said Eileen Collins, STS-114 mission commander, during apost-test briefing. "It felt to me like a real launch date." Collins, athree-spaceflight veteran, and her STS-114 crew are currently scheduled tolaunch toward the International Space Station (ISS) no earlier than July 13.The flight is NASA's first shuttle mission to fly since the 2003 Columbia disaster that ledto the loss of that orbiter and its STS-107 crew. NASA had previouslytargeted a launch window opening on May 22 for Discovery, before pushing toJuly to allow more time for external tank checks, ice debris evaluation andcontaminated thermal blankets on the orbiter. It was launch debris - a suitcase-sizedchunk of external tank insulation - that damaged to Columbia's left wing, allowing hot gases toseep in during reentry and ultimately destroy the orbiter, investigators found. But Discovery'slaunch delay will come in handy for the shuttle's crew, the astronauts said. "It helpskeep us moving and by working ahead [and] helps us pointout our weak areas," Collins said, adding that she and her crew are committedto launch. "Yes we have had a delay...we will fly." Undercloudy skies, the STS-114 astronauts walked out of their crew quarters inorange flight suits and boarded the AstroVan bus that would carry them toLaunch Pad 39B, where Discovery and its propulsion stack currently sits. The launchrehearsal, a standard activity that precedes every shuttle launch, is called aTerminal Countdown Demonstration Test (TCDT). "We neverdid the TCDT for our original launch," said Collins, adding that the STS-114mission was originally set to launch in March 2003 but was rescheduledfollowing the Columbia accident. "We stopped training." WhileDiscovery's crew reported to the launch pad at about 7:45 a.m. EDT (1145 GMT),the simulated countdown actually began a day earlier - at 8:00 a.m. EDT (1200GMT) May 3 - for the mission's launch team. "Thethought did go through my mind today that the last crew that strapped in at thelaunch pad was the STS-107 crew," Collins said. "So we were very focused comingout of this test to make sure that every little detail is being considered." The firstsignificant glitch occurred at about 8:52 a.m. EDT (1252 GMT), when launchcontrollers were unable to communicate with Discovery's mid-deck crew. Afterreplacing a communications box and resetting a switch, the problem was solved. The poorweather, however, persisted and would have ultimately violated shuttle flightrules on launch day, NASA officials said. A second communication problem, thisone between launch controllers and the Eastern Rangethat tracks the shuttle after liftoff also persisted, and would also have poseda dilemma. "We're notgoing to troubleshoot the range problem any more today, but on launch day thatwould be an issue because it is a requirement for launch," said NASA spokesmanGeorge Diller, who provided mission commentary during the mock launch attempt. Wednesday'slaunch abort test capped four days of flight procedure and emergency trainingfor the STS-114 crew, which the astronauts said was a motivating experience asthey worked toward a July launch. "We'regoing to get the shuttle flying, we'll get the International Space Stationbuilt and onto our exploration agenda," Collins said. "This is a very shortdelay in the big picture and we need to do it right."